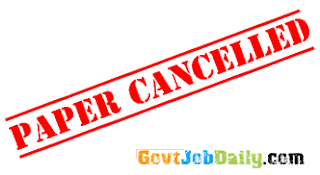 The Staff Selection Commission (SSC) has cancelled the Multi Tasking Staff (Non-Technical) recruitment examination 2016. In a notification issued on its official website on Tuesday, the commission said that the MTS (Non-Technical) examination, 2016 in the OMR based mode is cancelled. The commission had fixed five days for conducting the examination i.e. on 30.4.2017, 14.5.2017, 28.5.2017, 04.6.2017 & 11.6.2017 . The commission had already conducted the examination on April 30 and May 14. However, exams for all the five days have been cancelled by the commission due to paper leak. According to reports, more than 60 lakhs candidates have applied for 8,300 Multi-Tasking (Non-Technical) Staff (MTS) posts in the country advertised by the SSC. The examination is held to select junior staff in central government departments. The said examination would now be conducted by the Commission afresh in the computer based mode, tentatively during the month of September-October, 2017. The details in this regard would be hosted on the SSC website of the Commission in due course.